1970-07-08. New. Ships with Tracking Number! INTERNATIONAL WORLDWIDE Shipping available. Buy with confidence, excellent customer service! 1970-02-01. Good. Ships with Tracking Number! INTERNATIONAL WORLDWIDE Shipping available. May not contain Access Codes or Supplements. May be ex-library. Shipping & Handling by region. Buy with confidence, excellent customer service! Doubleday & Company, 1970-01-01. Hardcover. Used:Good. Doubleday & Company. Hardcover. 0385031092 New Condition. . New. 1970-07-08. Good. Ships with Tracking Number! INTERNATIONAL WORLDWIDE Shipping available. May not contain Access Codes or Supplements. May be ex-library. Shipping & Handling by region. Buy with confidence, excellent customer service! Garden City: Doubleday & Company, 1970. 320p., many colored and b/w illus., dj. Doubleday & Company, 1970. Hardcover. Horses; Riding; The story of man's ways and mans of riding horses from ancient time to the present. (320 Pgs.) Illustrated in B/W. Owner's initials and date on cover page. DJ & BOOK NEAR VVG. Doubleday & Co, Inc. Collectible - Very Good. First edition copy. Collectible - Very Good. Very Good dust jacket. Doubleday & Company. Hardcover. 0385031092 Like New Condition. . Fine. Doubleday & Co., Inc. Used - Good. Former Library book. Shows some signs of wear, and may have some markings on the inside. New York: Doubleday. 1970. Hardcover. 0385031092 . Very Good in a Very Good dust jacket. Half inch tear to lower rear panel. ; 4to 11" - 13" tall; On Sale! . Doubleday. Very Good in Very Good dust jacket. 1970. Hardcover. 0385031092 . Exlibrary, usual markings. ; 320 pages . Garden City, NY: Doubleday & Company. Fine copy in fine dust jacket. 1970. 1st. hardcover. Tall 8vo, 320 pp., "The Story of Man's Ways and Means of Riding Horses from Ancient Times to the Present" . New York: Doubleday & Co. 1970. Small Quarto Size [approx 17.5cm x 24cm]. Very Good condition in Very Good Dustjacket. DJ protected in our purpose-made plastic sleeve. Faint speckling to book lower edge. And some mild foxing to preliminary pages. Previous owner's details to front free end paper. Illustrated with colour and black and white photographs and drawings. 320 pages The story of man's ways and means of riding horses from ancient times to the present. . 1st Edition. Hardback. London: Longmans, 1970. Title only,Full detail to follow , E-mail in the meantime .. This the First Edition. Very Good Faded Edges/Near Fine Not Price Clipped Ss. Doubleday & Company, 1970. VG+ in VG+ dj with few small dj edge chips. Light small paperclip mark to top edge of first three pages else very clean in sound binding. . First Edition. Hard Cover Cloth. Very Good +/Very Good +. London: Longman, Green, Longman, Roberts, and Green, London, 1865, 1970. First Edition. Cloth Bound Boards. Very Good/Very Good. 4to - over 9¾" - 12" tall. Size 10" x 7½", 320 pages. Green cloth with horse motif blind embossed on the front cover and gilt titles to the spine. Illustrated dust jacket. Book condition very good, corners and spine edges rubbed, else fine. Dust jacket condition very good, spine slightly faded, spine edges slightly rubbed, else fine, not price clipped. Beautiful colour and black and white photographs and illustrations throughout. The history of riding and horsemanship over 4 thousand years. Doubleday. Chenevix-Trench, Charles. 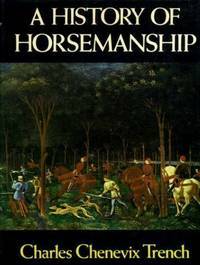 A History of Horsemanship. Garden City, New York: Doubleday, 1970. 320pp. Indexed. Illustrated. Bibliography. 4to. Green cloth. Book condition: Very good with gently rubbed and bumped edges and spine slightly askew. . Very Good. 1970. Longman. Very Good in Good dust jacket. 1970. First Edition. Hardcover. 0582108071 . Very good copy in good dw, wear to spine ends and corners bds, a little to some other edges of bds, dw has cello repair to verso of spine ends and verso of bottom edge fold over, where there are small tears, much wear to tail of spine. ; 8vo 8" - 9" tall; 320 pages . Doubleday & Company. Used - Good. Shows some signs of wear, and may have some markings on the inside. NY: Doubleday. Good with no dust jacket; some wear Ex-Library with Markings. 1970. Hardbound. 0582108071 . 320 pages . Prentice Hall Press. Hardcover. POOR. Noticeably used book. Heavy wear to cover. Pages contain marginal notes, underlining, and or highlighting. Possible ex library copy, with all the markings/stickers of that library. Accessories such as CD, codes, toys, and dust jackets may not be included. Doubleday & Company. Hardcover. POOR. Noticeably used book. Heavy wear to cover. Pages contain marginal notes, underlining, and or highlighting. Possible ex library copy, with all the markings/stickers of that library. Accessories such as CD, codes, toys, and dust jackets may not be included.